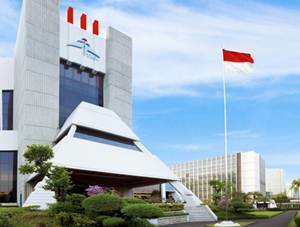 PT Tugu Pratama Indonesia Tbk - TPI or referred to as "Asuransi Tugu" is a well-known public-listed general insurance company in Indonesia. Asuransi Tugu has core business competencies on loss insurance services related to oil and gas industry as well as marine hull. Asuransi Tugu also offers a full range of insurance products; health insurance, credit insurance, aviation insurance, credit insurance, fire insurance, transportation and salvage insurance. Asuransi Tugu is based in Jakarta and now operates 6 domestic branch offices (Surabaya, Bandung, Medan, Balikpapan, Semarang and Palembang), 1 overseas office (Hongkong) and was supported by 326 employees. Its head office is registered at Wisma Tugu I Jalan HR Rasuna Said Kav. C8-9, Jakarta 12920. PT Tugu Pratama Indonesia Tbk is a non oil and gas subsidiary company of state-owned oil giant PT Pertamina (Persero). Asuransi Tugu was established by PT Pertamina (Persero) on 25 November 1981 to provide risk protection particularly in Indonesia for Pertamina’s assets with specialization in business-to-business at oil and gas sector. In May 2018, Asuransi Tugu went public and its shares are traded on the Indonesia Stock Exchange (IDX) under reference code TUGU. At present, PT Tugu Pratama Indonesia Tbk is 55% owned by PT Pertamina (Persero), 15.84% by PT Sakti Laksana Prima, 10.94% by Siti Taskiyah, 4.72% by Mohamad Satya Permadi and 10% by Public. According to information found in PT Tugu Pratama Indonesia Tbk Annual Report 2017 as cited by JobsCDC.com, Asuransi Tugu booked total comprehensive current year revenue of USD60 million in 207. This number is down 65% year-on-year (YOY) from USD174 million in 2016. Asuransi Tugu booked gross premium which was 24% lower from the previous year, or from USD256 million in 2016 to USD196 million in 2017. Referring to its annual report, Asuransi Tugu managed to yield USD45 million in current year profit. This number is a 35% drop in current year profit compared to that in 2016 which reached USD69 million. Minimum education in Bachelor of Engineering / MIPA from reputable universities with GPA min. 2.80. Minimum 5 years experience in the same field / position in the same field. Maximum age 35 years old before 1 September 2018 with a good medical history. Have knowledge and insight in the General / Loss Insurance industry. Have a professional certification in insurance, AAAIK or AAIK is an added value. Based in Denpasar / surrounding areas and willing to be placed in Denpasar Branch Office [UW - DPR]. Based in Cirebon / surrounding areas and willing to be placed in Cirebon Branch Office [UW - CBN]. Based in Pekanbaru / surrounding areas and willing to be placed in Pekanbaru Branch Office [UW - PBR]. Based in Bandar Lampung / surrounding areas and willing to be placed in Bandar Lampung Branch Office [UW - BDL]. Based in Makassar / surrounding areas and willing to be placed in Makassar Branch Office [UW - MKS]. Minimum education of Bachelor (various majors) from reputable Universities. Have minimum 10 years of experience with a minimum of 5 years in the same field / position. Maximum age 40 years old before 1 September 2018 with a good medical history. Able to work in teams, quickly learn and adapt, have high analytical skills and good interpersonal skills. Based in Denpasar / surrounding areas and willing to be placed in Denpasar Branch Office [BRH - DPR]. Based in Cirebon / surrounding areas and willing to be placed in Cirebon Branch Office [BRH - CBN]. Based in Pekanbaru / surrounding areas and willing to be placed in Pekanbaru Branch Office [BRH - PBR]. Based in Bandar Lampung / surrounding areas and willing to be placed in Bandar Lampung Branch Office [BRH - BDL]. Based in Makassar / surrounding areas and willing to be placed in Makassar Branch Office [BRH - MKS]. JobsCDC.com now available on android device. Download now on Google Play here. Please be aware of recruitment fraud. The entire stage of this selection process is free of charge. PT Tugu Pratama Indonesia Tbk - Underwritter, Branch Head Pertamina Group August 2018 will never ask for fees or upfront payments for any purposes during the recruitment process such as transportation and accommodation.